Over the past few years there has been a remarkable increase in alternative and complementary therapies for animals. Hydrotherapy for dogs is one of them. In June 2004 Katie’s K9 Therapy Centre & Pet Supplies opened its doors to help transform dogs’ lives. Sarah Mallett, the Hydrotherapist and owner of the centre has been swimming dogs for over seven years. The story began when her Border Collie, Katie, was diagnosed with a condition which meant that she couldn’t exercise without overheating, therefore losing muscle tone. The only safe exercise for her was to swim. However, the hydrotherapy pool was so far away that Sarah decided to build her own pool at her house! Over the years Katie’s pool became more and more popular and Sarah was finding it increasingly impractical working from home. With this type of treatment being in demand and the benefits being recognised by local veterinary practices and specialist referral centres, Sarah took the plunge and opened a Therapy Centre in Ashingdon Road to help others. 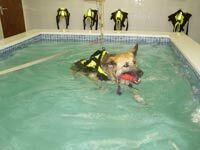 The centre is a member of the Canine Hydrotherapy Association (CHA) which a few years ago was founded by a group of therapists, Sarah being one of them. The group wanted people to realise that hydrotherapy was not a gimmick and that therapists were extremely knowledgeable in their field. They decided to form a governing body, the CHA, which created guidelines and protocols which members must adhere to. Members also need to pass examinations and keep up-to-date with their training, ensure standards are maintained and Aims and Code of Practice adhered to. The word is derived from the Greek for ‘water healing’. Swimming is known to improve muscle tone, stamina and general fitness in people, so it follows that it will bring the same benefits to dogs. When a dog is recovering from injury or surgery, swimming can be a huge benefit as it is a form of weightless exercise. In many cases a dog will move differently to compensate for its weakness and cause further problems. In the case of Arthritic joints, exercising on hard ground will aggravate the condition. A dog can return to general fitness quickly as it will work harder in the water than on land. Sarah works closely with veterinary surgeons to ensure maximum benefit for each individual case. Dogs not only come to the centre to aid their recovery from injury or surgery, but also to improve their muscle tone, stamina and to have fun in the pool. It also offers great cardiovascular exercise and improves the dogs’ wellbeing and makes them feel great. The centre has a rectangular pool fitted with a hoist and lifting harness to help larger breeds enter the water and floatation jackets available for every size of dog. The water is kept at a constant temperature of 28ºcelsius and is kept clean by a comprehensive filtration system. 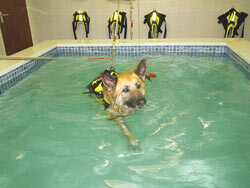 Built in water jets are controlled by the hydrotherapist to ensure the dog gets the correct level of water resistance. A Hydro Spa is also available which is a passive form of hydrotherapy. In the Spa the dogs can relax whilst warm water jets, heated to 38ºcelsius, ease their muscular strains and tones their muscles. CAN I TAKE MY DOG SWIMMING? 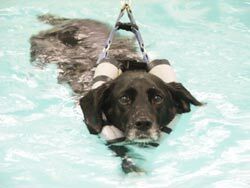 You will need a referral letter from your veterinary practice saying that your dog is fit for hydrotherapy. All veterinary practices in Essex and the surrounding counties have our details and Referral Forms to fill in upon your request. We also require a copy of your dogs vaccination records. Sessions are available Monday to Saturday morning and Monday, Wednesday and Friday afternoons, and evenings (we cater for those who work until late). The Hydrotherapist will discuss with you the exercise programme and answer any queries and concerns you may have. All clients are treated as individual cases and a complete rehabilitation programme is worked out by our qualified hydrotherapist. ‘Cody’, a German Shepherd suffers from Hip Dysplasia. 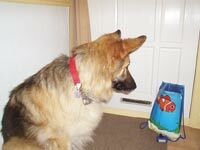 When our beautiful German Shepherd puppy ‘Cody’ was a year old she was diagnosed with Hip Dysplasia. We were devastated as we knew her life was about to change. She had to have pain killers everyday and her exercise was limited. We coped really well for a while but when Cody reached the age of four we noticed her personality was changing. She became very withdrawn and just didn’t seem to be able to get out of bed in the mornings especially when it was cold and damp. Out vet listened to our concerns and referred us to Sarah at Katie’s K9 Therapy Centre as he felt that swimming could be the answer. We were a little apprehensive at first but when we arrived Sarah put us as ease and assessed Cody. She put together a swimming plan that would suit her as each dog is different. She started by swimming Cody three times a week, then dropping to two and eventually once a week to maintain her fitness level. The first few lessons Cody only swam for a few minutes and gradually built it up to a 15 minute swim against a current. What we have witnessed in the last few months since Cody started her swimming is incredible. She has claws growing on her back feet which she never had before as she wore them out whilst out walking as she dragged her legs. The muscle tone all over her body is amazing, especially around her hip area. She doesn’t struggle to get out of bed in the mornings anymore and we have been able to reduce her medication. We feel that our dog now has the quality of life that she deserves and she is back to the old Cody that we knew before the hip dysplasia took over her and our lives. We can’t thank Sarah enough for all her help. Cody loves her and we can’t mention Sarah’s name or the word ‘swimming’ without Cody rushing to the front door dragging her swimming bag with her. As we arrive at the pool Cody sings with excitement and it is as much as Sarah can do to stop her jumping into the water before she has her harness on. Swimming is just a part of Cody’s routine now and we know that she will be able to do more and more as time goes by. There is no looking back! Cody was presented to me with severe hip Dysplasia, in a lot of pain and a very unhappy dog. Cody and her owners were quite nervous upon arrival for their first appointment, but once Cody was examined and the procedure explained, they felt at ease. 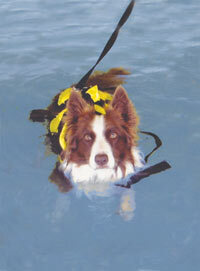 Unlike most dogs Cody managed five minutes on her first swim which is the maximum allowed on an initial appointment. Cody did seem to really enjoy her first swim and afterwards I explained to Lynn and Charlie (Cody’s owners) what to expect of Cody in the next 24 hours. Over the next few weeks she showed remarkable improvement and her progress was outstanding. Over the past 4 months Cody’s progress has been continually monitored and swim times gradually increased. Therapy jets were also incorporated into her sessions. Not only do we have a happy healthy German Shepherd but also an ecstatic owner. Anyone can take their dog swimming if agreed by your vet. There are many reasons why dogs need hydrotherapy and just a few of these ailments are listed.